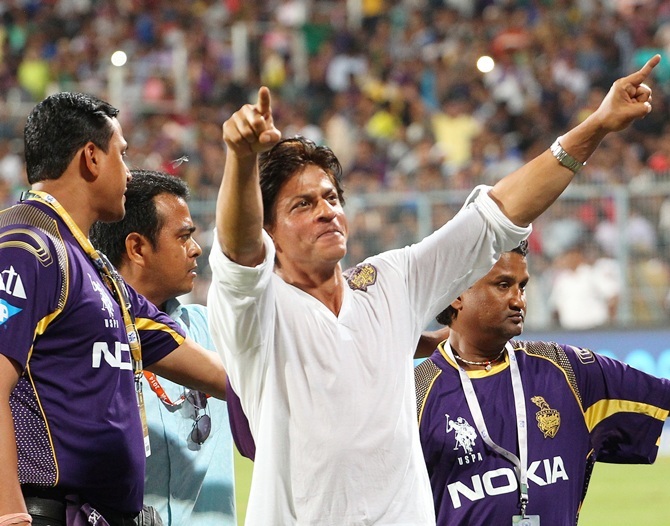 It was the Veer-Zaara match in Kolkata on Wednesday, and the Eden Gardens erupted in celebration as Shah Rukh Khan’s Knights won the contest. Fans of Kolkata Knight Riders went wild in jubilation on seeing the popular onscreen star pair of the 2004 romantic drama Veer-Zaara. Shah Rukh Khan was a perfect gentleman. Here he seems to be telling Ms Zinta her team has yet another chance to make it to the final when they take on Chennai Super Kings. The Bollywood superstar could not hold his excitement after his team stormed into the final of IPL. There was no stopping the Bollywood badshah. His Knights scored a thumping victory and he celebrated in style. 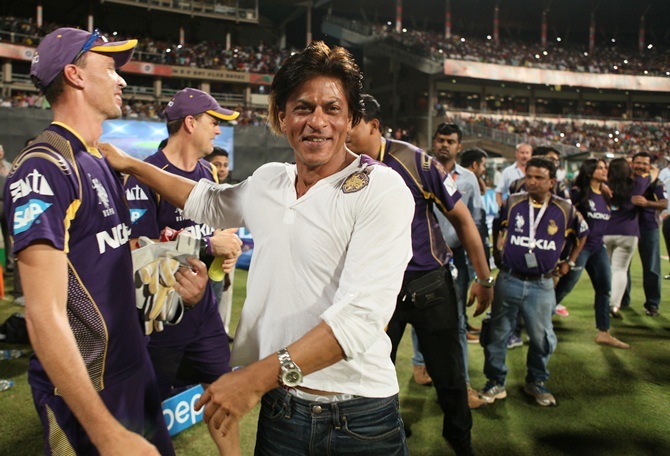 Dressed in white and purple jersey, Shah Rukh Khan was ecstatic after his team's solid display against Kings XI Punjab. Image: Shah Rukh Khan wants more noise from the fans. He went on a victory lap with his team after the match. 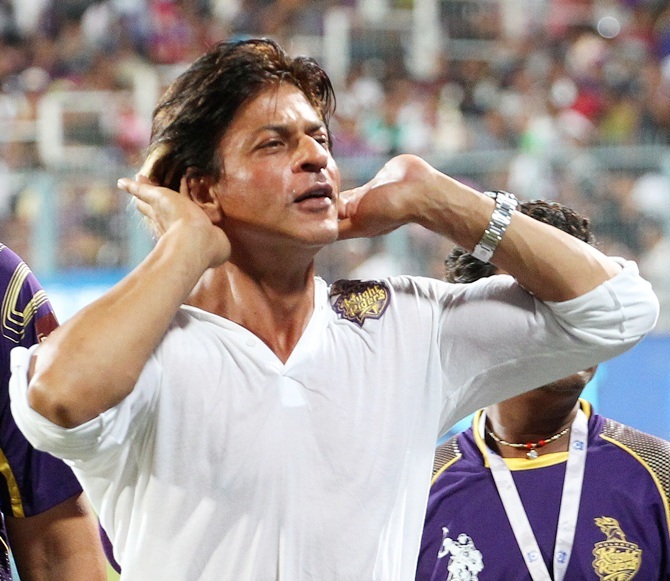 The fans roared to the strains of KKR’s anthem ‘Korbo Lorbo Jeetbo Re’ as Khan waved to them and blew kisses. Next on the radar were his Knights. The players were rewarded with a peck! SRK had missed Yusuf Pathan’s matching-winning innings in the previous match, but tweeted the batsman powered KKR into the play-offs after blasting a majestic 22-ball 72 against Sunrisers Hyderabad to rocket the team to the second spot in the IPL table. “YYYYYYUUUUUUUSSSSSSUUUUUUUFFFFFFFFFF……There is no other PATHAN….nobody. We love u! Love u. Love u." 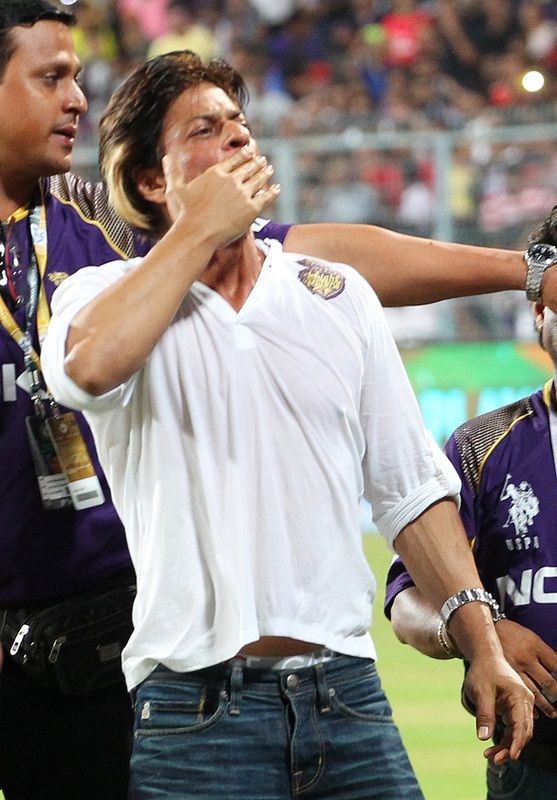 Image: Shah Rukh Khan kisses a KKR player. Of course, the other KKR players players were not left out. Shah Rukh Khan showed how much he appreciated the showing of man of the moment Robin Uthappa by giving him a warm embrace. If KKR have reached the final is is purely because Uthappa has scored big. He is the leading scorer this season with 655 runs. Other team owners also expressed their emotions on the field, but Wednesday night was different. It belonged to SRK and his Knights. It all started with hugging queen of IPL, Preity Zinta. The dimpled beauty gave hugs to her Kings XI Punjab players whether they won or lost. Image: Preity Zinta (right) celebrates with Glenn Maxwell during an earlier match this season. Soon the hugging bug bit all in the IPL and Rajasthan Royals' co owner Shipla Shetty followed suit. Image: Shilpa Shetty hugs a player. Mumbai Indians owner Nita Ambani went on a hugging spree with her players after the sensational victory over Rajasthan Royals that helped them qualify for the play-offs. An emotional Aditya Tare, who won the match with a six off James Faulkner, celebrates with Ambani. Image: Nita Ambani hugs Aditya Tare as Arjun Tendulkar (right) looks on.